TWYST INTRODUCES "THE AMP" WITH "NOTES"
Simply put the AMP is Twyst's latest RFID technology that turns your space, whether it is you business of your home, in to the most connected and smart environment on the planet. 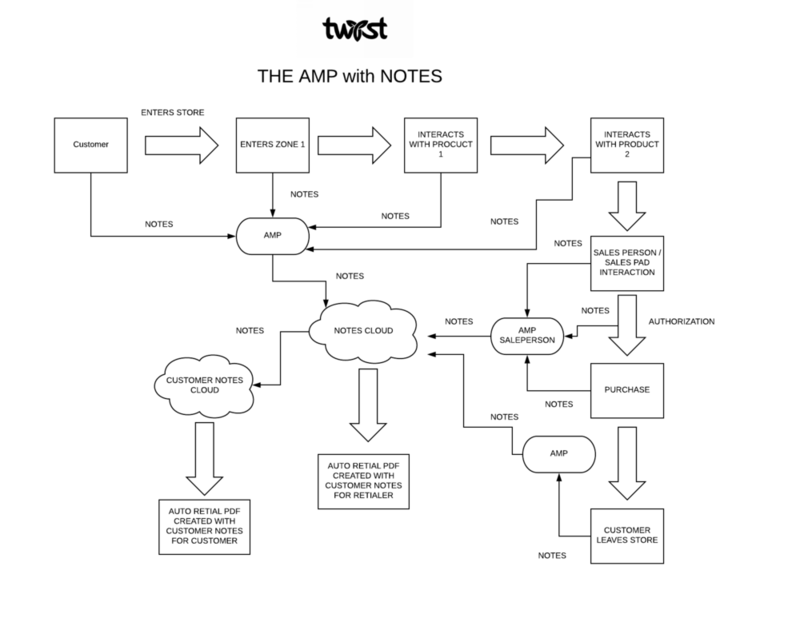 Thru Twyst's patented technology, the AMP is the worlds best, detailed and accurate note taker. What NOTES does the AMP Deliver? The AMP takes customer notes on everything they talked about during in store visits. The AMP will automatically send notes to the customer and send notes to retailer in real time. The AMP also allows the sales associate to ability to authenticate transactions with customer for a seemless no line check-out! How does the AMP and Notes help sales associates? Where do all the NOTES go? Gives customer recmmendations on future products and services. Algorithims for trends and behavior for customers and retialers alike!